The Ohio Bobcats have scored just six points in their last six quarters of football. They’ll need a much improved offensive attack on Saturday when they travel an hour south to Huntington, West Virginia, to take on their rival, the Marshall Thundering Herd. The Bobcats have won in their last three meetings with the Herd, but to make it four straight the ‘Cats have to slow down Marshall’s powerful offense led by quarterback Rakeem Cato. Cato, a senior, was named the 2013 Conference USA Offensive Player of the Year last season and has continued to tear apart defenses so far this season. His combination of skills with his arm and legs have him listed as an outside contender for this year’s Heisman Trophy, but Cato has yet to defeat Ohio in three tries. When the two rivals met at Peden Stadium last season, Ohio held off a late Marshall rally to win 34-31 and keep the Bell trophy in Athens. Cato had a touchdown on the ground and racked up 366 yards and a touchdown through the air, but he threw a costly interception early in the fourth quarter that all but sealed the game for the Bobcats. Tyler Tettleton and Beau Blankenship combined for three touchdowns in last year’s victory, but Ohio’s backfield looks much different this season. In week three of the 2014 season, the Bobcats find themselves in the midst of quarterback controversy. Derrius Vick has been named the starter for Saturday’s matchup, but he was benched after a poor start at Kentucky in favor of J.D. Sprague. Neither quarterback was able to muster much momentum and Ohio fell to the Wildcats, 20-3. The Bobcats will have to deal with the feisty crowd at Joan C. Edwards stadium – one of the toughest environments in all of college football. Ohio (1-1) emerged victorious in its last outing at Marshall, but the fans left some vivid memories in the minds of Bobcat players. “We played them two weeks after Penn State, and it surprised me that it was louder (at Marshall) than them,” Smith said. “We know they’re going to be loud, obnoxious and aggressive. The fans are probably more aggressive than the players at times. Ohio leads the all-time series vs. Marshall 32-19-6. Photo by the Huntington Herald-Dispatch. Offense: WR Chase Cochran – The Bobcats’ top returning threat on offense this season has gotten off to a slow start to say the least. Cochran has pulled in just two receptions for 14 yards through two games. Some of this can be attributed to shaky quarterback play, but that doesn’t explain why Cochran, a senior, has been nearly invisible in the Ohio’s offense this season. Cochran had more than 14 yards in every game he played last season. Look for him to make a bigger impact in his last Battle For The Bell. Defense: LB Quentin Poling – The freshman linebacker had two red zone sacks that prevented Kentucky from extending its lead last weekend. For what it’s worth, Poling is currently tied for sixth in the FBS with 3.0 sacks. He’s stepped up so far this season and will be tasked with keeping Cato in check Saturday. Offense: WR Tommy Shuler – The 5-foot-7-inch senior has been Rakeem Cato’s top target since the two played together in high school. He had nine receptions for 95 yards in the Battle For The Bell last season. Shuler is one of only eight receivers in major college football history with two seasons of 100 or more receptions. He and Devonte Allen will be a tough test for the Ohio secondary. Defense: DL James Rouse – Now a sixth-year senior, Rouse was named the 2014 C-USA Preseason Defensive Player of the Year by coaches prior to this season. He was voted Team MVP by his Thundering Herd teammates last season after racking up 6.0 sacks. The Bobcats struggled last week with the defensive line of Kentucky; Rouse and fellow lineman Ra’Shawde Myers could pose an even bigger problem this week. 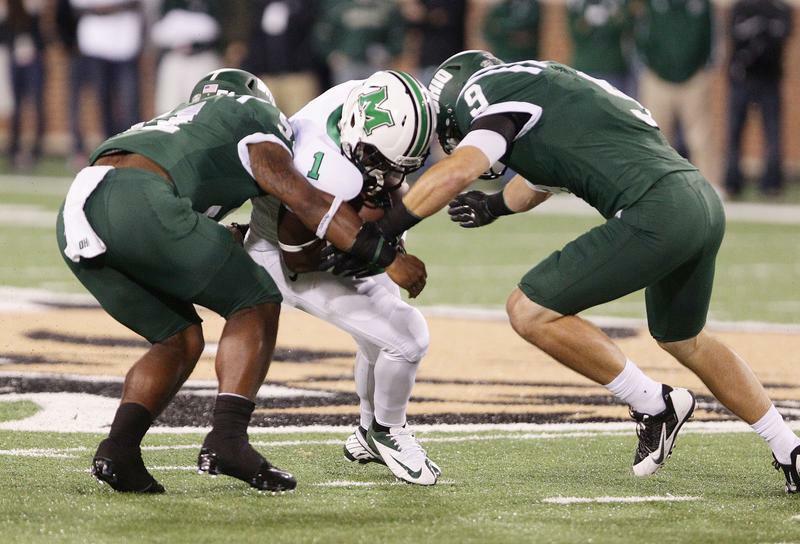 Marshall 42, Ohio 28 – The Bobcats will keep it close for most of the game. Vick and Sprague will alternate series behind center and both will put up adequate performances, but not enough to keep up with Cato and the high-powered Herd offense. Marshall will pull away in the fourth quarter to reclaim the Bell.